Early check-in or late flight? Use the free baggage check area at security station and use the pool or beach while you wait! Dive boat pickup. There are 4 convenient locations for dive boat pickup near Residencias Reef: 1) Pier in front of Bldg. #5; fee of $2.00 US per person per day for pick-up/droff-off (roundtrip); vouchers can be purchased at RR front security gate; 2) 300 yds. south at San Francisco Beach club (no pier); 3) Pier at Paradise Beach (just south of San Francisco Beach); 4) 300 yards north at the adjacent resort (San Clemente pier). Before you book your dives, check with your dive operator to see which site they will pick you up. 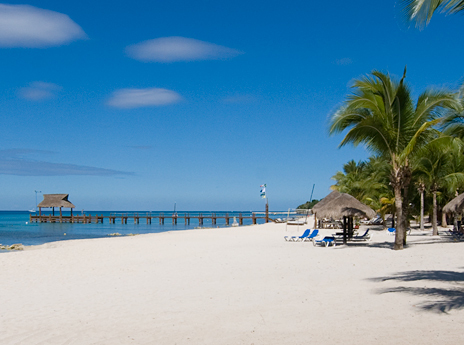 Residencias Reef is located 11 Miles south of Cozumel's only town (San Miguel) on San Francisco Beach, the most beautiful beach on Cozumel. It is just a 5 minute boat ride to some of the greatest reefs, it's perfect for divers . . . and beachcombers. You can also snorkel just off the beach. And that beach stretches for miles and miles so you can run or jog for as long and as far as you like. 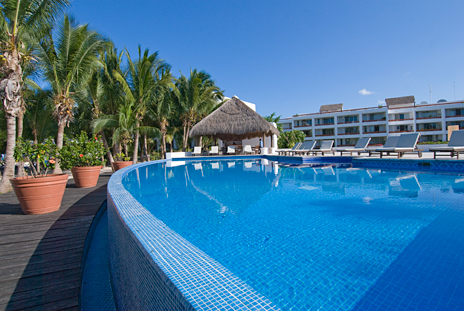 There are several beach bars and restaurants within a short walk along this stretch of beach; they are open during the day but close about 4 or 5 p.m.
Residencias Reef has studio units, 1 BR, 2 BR, 3 BR and 4 BR condos. All units have air conditioning and safes. Some have washers and dryers. Day passes are available at two adjacent resorts. Day passes start at $65 per person per day. Passes are not available Nov. 25-Dec. 3. Some units have Vonage (Free long distance to US and Canada); see individual unit descriptions. Closest location on San Francisco beach is at the pier at the adjacent resort (indicated on map below as building #5, so it's virtually at your doorstep. This pier is operated by the hotel's dive shop, but other dive boats are allowed to pick up there as well. There is a fee of $2.00 US per person per day for pick-up/drop-off (roundtrip). 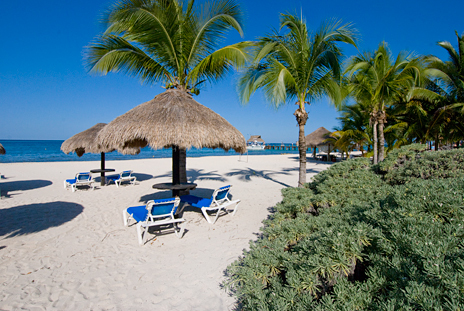 Residencias Reef guests can purchae pier vouchers at the RR front security gate. Just 300 yards south is the San Francisco Beach Club where dive operators also make pickups (no pier with pick-ups right off the beach). Still a little farther south there is another pier at Paradise Beach; sometimes they allow pick-ups too. A fourth pickup site is about 300 yards to the north of the condos, just past the northern border of a nearby resort. This is the Sand Dollar, or San Clemente Pier. Before you book your dives, be sure to ask your dive operator which site they will pick you up at. 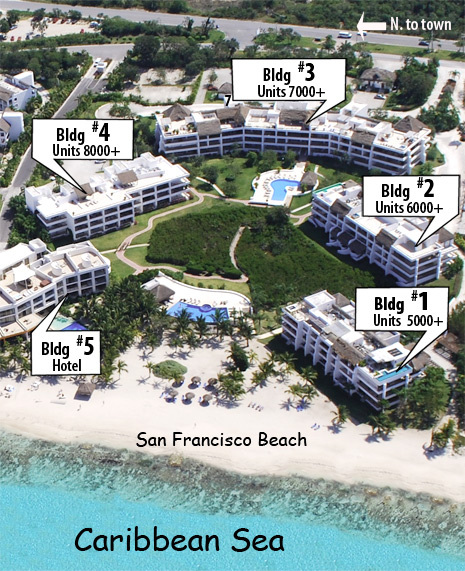 Click for MORE PHOTOS of Residencias Reef and the area. Click here > to VIEW LARGER Map. 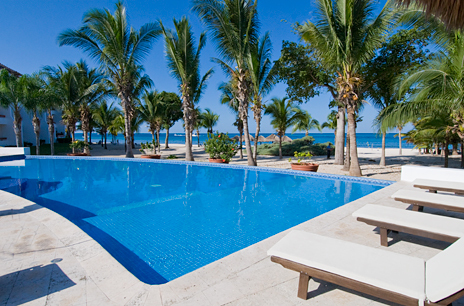 Between the swimming pool and the Caribbean is a cluster of tropical palms. 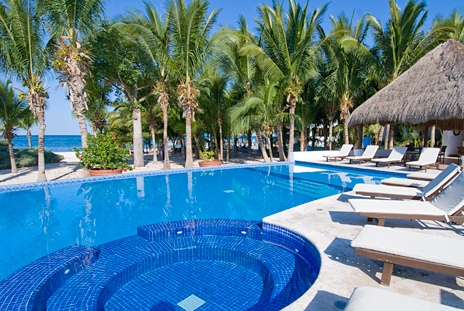 A poolside palapa provides shade from the sun.